Live Oak Plantation’s homebred March to the Arch unleashed a late kick to earn his first stakes victory for trainer Mark Casse in the 119th running of the $100,000 Toronto Cup on Saturday afternoon at Woodbine Racetrack. One of three Casse trainees in the three-year-old turf stakes contested over 1-1/8 miles, March to the Arch defeated Chiefswood Stable homebreds Rose’s Vision and Neepawa in 1:48.07. Under a tight hold by jockey Gary Boulanger, March to the Arch raced between rivals near back of the field early on. He settled back second-to-last at the half-mile mark and waited until the turn to commence his attack. Around the bend, he began to angle outside and hauled down late leader Neepawa, also trained by Casse, for the 1-3/4 length victory, with Rose’s Vision closing inside to get up for second-place honours. Lookin to Strike, the other Casse trainee owned by Gary Barber, raced on the lead for the first three-quarters through fractions of :24.38, :47.82 and 1:11.99 with Inge pressing the pace. Neepawa came on and struck the front at the mile mark in 1:36.06 before being passed by March to the Arch and Rose’s Vision. Casse has now won five of the last eight editions of the Toronto Cup. March to the Arch was the 5-2 second choice in the field of eight and paid $7.70, $3.40 and $2.30. He combined with 2-1 favourite Rose’s Vision ($3.30, $2.60) for a 5-2 exacta worth $25.80. A $1 trifecta of 5-2-6 (Neepawa, $3.80) paid $64.40 and a $1 superfecta of 5-2-6-1 (Flight Deck) returned $501.20. Archaggelos, O’Kratos, Lookin to Strike and Inge completed the order of finish. 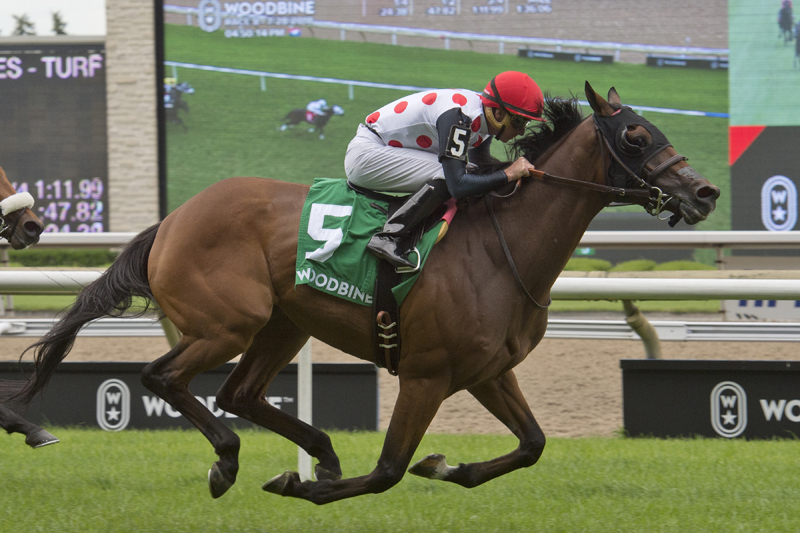 Live Thoroughbred racing continues at Woodbine on Sunday afternoon, featuring the $175,000 Royal North Stakes (Grade 2) and $125,000 Vigil Stakes (Grade 3). First race post time is 1 p.m.